Godard in “Pierrot My Friend,” in Godard on Godard, ed. Jean Narboni and Tom Milne (New York, 1986), 215; Godard in “Let’s talk about Pierrot,” in Jean-Luc Godard par Jean-Luc Godard, ed. Alain Berglia, trans. David Willis (Paris, 1985), 263. Godard asks spectators to reassess their relationship with the conditions of modern life as well as modern cinema. Godard described Pierrot le fou in promotional materials in terms of titles of his prior films: “UN PETIT SOLDAT QUI DECOUVRE AVEC MEPRIS QUʹIL FAUT VIVRE SA VIE, QUʹUNE FEMME EST UNE FEMME, ET QUE DANS UN MONDE NOUVEAU, IL FAUT FAIRE BANDE A PART POUR NE PAS SE RETROUVER A BOUT DE SOUFFLE.” See Jean-Luc Godard in “Slogans pour Pierrot” (1965), in Jean-Luc Godard (Paris, 2012), 110. Jean-Luc Godard in “Slogans pour Pierrot” (1965), in Jean-Luc Godard(Paris, 2012), 110 (my translation). Ferdinand and Marianne's story begins with a chance meeting: Marianne Renoir, Ferdinand's ex-lover, is posing as the niece of his friend Frank (with whom she carrying on an affair); she is enlisted to babysit Ferdinand's daughter while he accompanies his wife, Maria, and friends to a cocktail party at the home of his wealthy in-laws, Madame and Monsieur Espresso. Ferdinand had worked in television, but recently lost his job. His wife hopes that her father can introduce him to a Standard Oil executive at the party who might want to hire him. The reencounter with bohemian Marianne prompts Ferdinand to reject his bourgeois life and its associated rituals, and run away with—or back to—her. But tuning in and dropping out proves to be complicated: Marianne is involved in more dangerous activities than Ferdinand expects. His search for adventure and excitement takes him on a path toward gun-running and deadly intrigue. His transformation from upright citizen to secret agent or revolutionary begins to concretize when, early in the film, Marianne baptizes him with the moniker "Pierrot" as he drives her home. She insists on referring to him by this name, despite his protests. Pierrot is one of the stock characters from the Commedia dell'arte, the tragic and naive clown dressed in white and smitten with the female character Columbine. Marianne’s interpolation seems to work: rather than drop her off, Ferdinand stays the night. From this moment, he veers further and further away from staid Ferdinand and toward the "crazy"(fou) Pierrot. Figs. 2 - Still from Jean-Luc Godard, Pierrot le fou, 1965, color, courtesy of Rialto Pictures. Ferdinand's change is further cemented with a cut from the automobile nocturne to the cold light of day at Marianne’s apartment, which houses a cache of the arms she is involved in smuggling (fig. 2) and a dead body with scissors plunged into the nape of its neck. Frank arrives on the scene; Marianne smashes a bottle over his head while Ferdinand distracts him, an episode that compels them to flee Paris. They head south, sustaining themselves by criminal activity and storytelling. They fake a car accident and proceed on foot, eventually stealing another car to make the final leg of the journey to hide out in the Cote d'Azur. There they live, relatively isolated from modern life, periodically performing for tourists to earn a living. Ferdinand turns increasingly self-involved as he attempts to devote himself to writing. Despite their idyllic surroundings, Marianne becomes disenchanted and bored with this elemental mode of subsistence. "We've played Jules Verne long enough! Let's go back to our gangster movie!" she exhorts. And they return to urban life, traveling to the small city of Toulon. There, a band of criminals, apparently members of the OAS (Organisation armée secrète, a short-lived right-wing terrorist entity that operated in opposition to Algerian liberation)—whom Marianne seems to have double-crossed, tracks them down. Confirmation that Godard intended them to be the criminal group comes in the red letters, "OAS," on the wall of the Paris flat Marianne occupied after dispatching its prior occupant; she amended "IS" in blue, staking her claim and relabeling it "OASIS. "), Marianne kills one of them and escapes, while Pierrot is tortured by the others. Although they are separated for a time in the confusion, when they find one another Marianne convinces Ferdinand to help her steal a case of money from the remaining OAS agents, which she intends to keep for herself and her real boyfriend, Fred. Ferdinand realizes he has been tricked and he follows Fred and Marianne, shooting them on sight before killing himself. Pierrot le fou establishes that it will blur boundaries of culture from the beginning. Quoting—literally—from the history of art, and pulling it into the movies, Ferdinand soaks in a bathtub while reading aloud passages on the famed Spanish baroque painter Diego Velázquez from a paperback edition of Élie Faure’s Histoire de l’art. In addition to the characters who recite art history, Godard situates reproductions of works of art throughout the film. 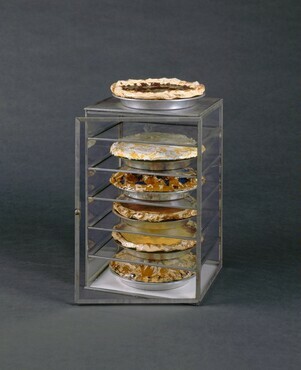 Donald Judd, “Specific Objects” (1965), in Theories and Documents of Contemporary Art, ed. Kristine Stiles and Peter Selz (Los Angeles, 2012), 138. Godard too plays with images of images, interweaving mechanical reproductions of artworks rather than originals, which are further multiplied by their capture, into the film. Artworks form one element of the sets' décor. Marianne's flat is replete with posters and postcards: the women of Amedeo Modigliani meet Paris Match, Picassos share the screen with automatic weapons—props equally proper to Hollywood and television news images of Vietnam (an idea hinted at when Ferdinand and Marianne entertain tourists with a play about the war). At different moments, both Ferdinand and Marianne are flanked by reproductions of Picasso's Portrait de Sylvette (1954) and Jacqueline aux fleurs (1954), implying parity between filmic and painterly representations. Richard Dienst, “The Imaginary Element: Life + Cinema,” in Jean-Luc Godard’s “Pierrot le fou,” ed. David Willis (Cambridge, 2000), 26 (original emphasis). Godard's interest in repurposing text again aligns him with pop and specifically with artists such as Lichtenstein and Warhol. His close framings of signage and hand-written texts, resembling the works of art discussed above as well as a number of spoken quotations from various kinds of sources, serve to break the narrative. Pierrot le fou commences with striking blue-and-red credits on a black background. Letters appear on-screen one by one in alphabetical order, finally spelling out the names of the actors and the title. Godard's title sequence is serial and ordered, in some ways paralleling Warhol's Campbell’s Soup Cans (1962), a series of silkscreens on canvas that was generated based on a specific, predetermined order (a list of flavors the Campbell’s company provided to Warhol). 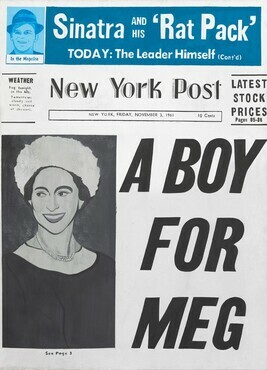 Texts pulled from preexisting sources also play an important role in Warhol's headline paintings, like A Boy for Meg (1962) (fig. 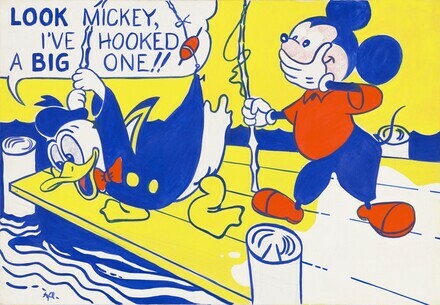 4), as well as in numerous works by Lichtenstein, in which the artist matches images with new comic-book dialogue. 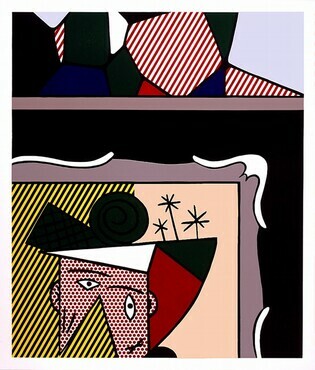 Lichtenstein interwove image and text in projects such as CRAK! (1963/1964) (fig. 5), which incorporates onomatopoeia as part of the picture via expressive, motivated typography. Arguably, this kind of designed language, found in comic books, efficiently transmits feelings or sounds that are difficult to portray in the traditional modes of visual art. Robert Rauschenberg, “Note on Painting” (1963), reproduced in Theories and Documents of Contemporary Art, 374. Fig. 6 - Still from Jean-Luc Godard, Pierrot le fou, 1965, color, courtesy of Rialto Pictures. Godard also alights his lens upon words found in the modern landscape. Like Rauschenberg, the director extends the logic of collage to language in Pierrot le fou by isolating and highlighting the extradiegetic information that is normally semiconsciously absorbed. For example, "SOS" appears behind Ferdinand, suggesting he is in trouble. Ferdinand and Marianne walk past a sign with a warning about a harbor-front drop that reads "danger de mort" (danger of death), which seems to presage the characters' fate (fig. 6). The director mines commercial signage, too, prompting its insistent typographies to be repurposed in order to make new messages. In a similar fashion, visual artist Ed Ruscha focuses on and manipulates language. Ruscha's word drawings reveal an understanding of the importance of graphic design and text in the experience of modern life. In the 1960s, Ruscha drew upon his background in layout design to render whimsical words and phrases in both commercial typefaces and his own drawings of objects such as pills, beans, pencils, or strips of paper. Ruscha's Standard Station (1966) (for illustration, see "Industrial Arts," fig. 12), a depiction of a gas station in clean geometric forms, also suggests a punning contemplation of the "standardization" of modern life, in which corporations, chain stores, and branded goods promote homogeneity and conformity. The possible double entendre appears in Pierrot le fou: Godard seems to trade upon the selfsame word play by selecting Standard Oil as the name of the company Maria hopes will hire Ferdinand, and two scenes were shot in Total gas stations. The camera captured the text of real signage, allowing the words to take on additional significance. Written words are marshaled into the filmic text; they resonate with and amplify the dialogues. Rather like the "Standard" in Ruscha's Standard Station, Godard’s "Total" can be read as taking on the meaning "sum total" (summing it up), and also might speak of a totalizing push toward a homogenized, standardized capitalist existence. Fig. 7 - Still from Jean-Luc Godard, Pierrot le fou, 1965, color, courtesy of Rialto Pictures. Andy Warhol quoted in Warhol and Pat Hackett, POPism: The Warhol ’60s, (New York, 1980), 280. This blur between the fake and the real is precisely what horrifies Ferdinand. In the scene where Maria, his wife, is getting dressed for the cocktail party, she cites a magazine ad for the Maidenform girdle she will wear and shows it to him. Godard pulls in close to the illustration and a photo of the product (fig. 7), accompanied by Ferdinand's voiceover: "After Athens, after the Renaissance, we are now entering the civilization of the rump." His sardonic words imply that instead of staying the course toward enlightened thinking, current society hews to pleasure, superficiality, and titillation. Andy Warhol quoted in Gene Swenson, “What Is Pop Art?” (1963), reproduced in "Statements," in Theories and Documents of Contemporary Art, 392. Godard too was clearly perturbed about the powerful grasp of mass-mediated consumer society on citizens' minds that Warhol describes. Pierrot le fou most explicitly explores them in the cocktail party scene. The cocktail party, a staple of bourgeois social life beginning in the 1950s, epitomizes the world that Ferdinand flees from. In scenes of the stuffy event he attends at his in-laws' home, guests' interactions are totally mediated through gendered advertising imagery. They communicate by trading slogans: Frank repeats the copy from an ad for "the new Alfa Romeo, with its four-wheel disk breaks," to which a woman responds, "To combat underarm perspiration, I use Odorono after my bath for all-day protection." The scene illustrates the strangeness of publicity speech, showing it out of context, in a "real" setting rather than a commercial. Fig. 8 - Still from Jean-Luc Godard, Pierrot le fou, 1965, color, courtesy of Rialto Pictures. Mohammed Sassi, "Compagnie Française des Pétroles and Its Contribution to the Re-establishment of France’s Position among the Oil Countries after the Second World War," Business and Economic History 4 (2006): 1–15. Ferdinand repeats the slogan of the competing American brand (Esso), telling the attendant to "put a tiger in my tank," before he and Marianne assault the attendants and steal gas for their car. Marianne affirms their rejection of work—and capitalist exchange—as she knocks one of the men to the ground with a Laurel and Hardy–inspired blow. Like Warhol Godard explored the motif of the auto wreck repeatedly. He staged his own "Saturday disaster" in his famous seven-minute traffic jam and bloody collision travelling shot in Week-end (1967), a film that can be considered a "double" of Pierrot le fou. In other scenes, Godard invokes disaster when he depicts Ferdinand being waterboarded; in the context of 1960s France, the torturous interrogation method was a specific reference to the Algerian War, a conflict that ultimately led to the North African colony’s independence. 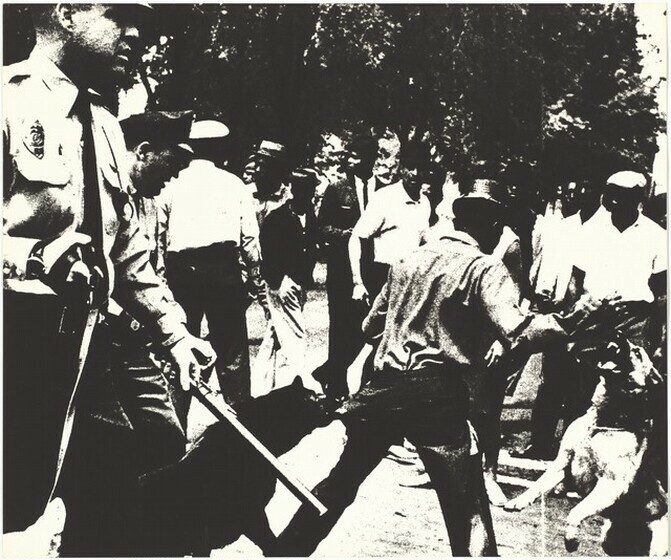 Such depictions would have potentially resonated with original audiences in a fashion quite similar to Warhol’s various iterations of Birmingham Race Riot (1964) (fig. 9). By graphically transmitting the way that the government—in the form of police force—brutally operated to maintain the order of things, Warhol's work indicts the ugly side of race relations in the United States. In addition to the scenes of burning cars and waterboarding, numerous weapons—including guns—make an appearance in Pierrot le fou. In the American context, the gun is a common pop element in television and film; the right to bear arms is mentioned in the Second Amendment of the US Constitution. Pop artists reflected the ubiquity of firearms in American culture (both fictional and real). 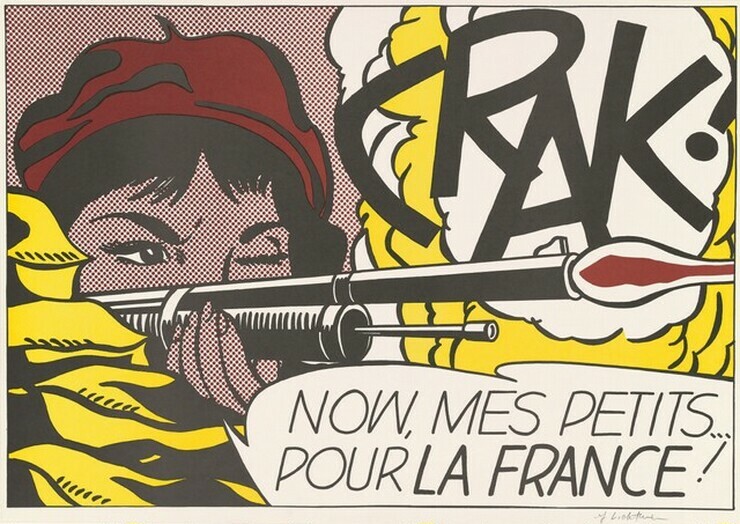 Warhol, Lichtenstein, and Oldenburg fixated on this aspect of modern society and incorporated representations of pistols and rifles into their work. For example, Warhol's Double Elvis (1963) depicts a reduplicated Elvis Presley, legs broadly spread, pistol drawn, in an image that hails from a publicity still from the film Flaming Star (1960). Cagney (1962–1964), Warhol's portrait of actor James Cagney wielding a Thompson submachine gun and flanked by another, similarly multiplies and highlights firearms. 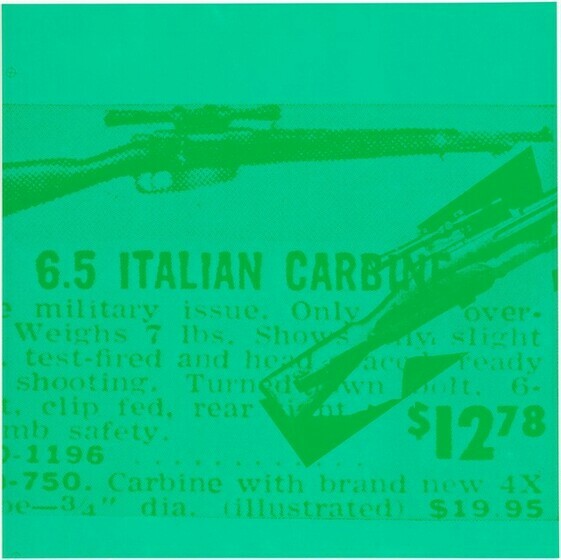 Warhol also dedicated a print portfolio to the killing of John F. Kennedy, which was the work of an assassin with a scoped, bolt-action Italian carbine (fig. 10). Pierrot le fou protagonists take an identical rifle when they go on the run (and which Marianne uses to shoot two men in a convertible): indeed, before tossing the firearm to Marianne, Ferdinand remarks that it is "the same make that killed Kennedy." In response, Marianne quips, "Didn’t you know it was me?" Fig. 12 - Still from Jean-Luc Godard, Pierrot le fou, 1965, color, courtesy of Rialto Pictures. Godard, Histoire(s) du cinéma, DVD, directed by Jean-Luc Godard, (1988–1998; Paris: Gaumont, 1999). Fig. 13 - Still from Jean-Luc Godard, Pierrot le fou, 1965, color, courtesy of Rialto Pictures. Oldenburg quoted in "Lot 353: Claes Oldenburg & Coosje Van Bruggen SCREW ARCH MODEL," Sotheby's, September 25, 2013, www.sothebys.com/en/auctions/ecatalogue/lot.353.html/2013/contemporary-art-n09010, (accessed June 10, 2017). His soft sculptures and papier-mâché objects typically depict everyday consumer products. By changing the scale, texture, and rigidity of these quotidian icons Oldenburg renders them strange: they seem to be the stuff of (bad) dreams made real. Oldenburg created nonfunctional ray guns, which he presented like specimens of natural history in his Ray Gun Wing (1977). In The Street (1960) and The Store (1961–1964) Oldenburg hawked "bad" consumer goods—sloppily painted, globby foodstuffs (fig. 14) and articles of clothing that do not provoke desire, but instead seem to confound consumption. Thus, in some ways he defied the function of the space of commerce that he parodied. Often, Oldenburg relied on shifts in scale and texture to produce uncanny objects; Godard achieves similar effects with the camera. A close-up of Karina's hand with scissors prompts them to become monstrous; the lens slightly distorts her now-gigantic digits and shears, making them appear softer and rounded. Marianne uses the scissors to commit murder more than once, giving them a sinister air and perhaps transforming them in the audience’s eyes from common, everyday object to lethal weapon (fig. 15). Oldenburg, too, recast gigantic scissors in a distinct role, envisioning them in 1968 as a replacement for the Washington Monument (fig. 16). His outlandish attempt to reimagine the obelisk also potentially asks audiences to reassess their relationship to memorials. Fig. 15 - Still from Jean-Luc Godard, Pierrot le fou, 1965, color, courtesy of Rialto Pictures. 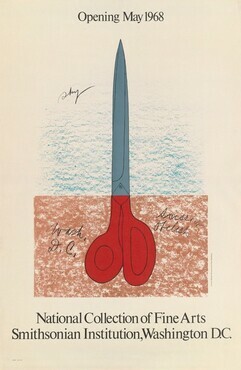 Oldenburg's films and performances also resonate with Pierrot le fou. Photo-death (1961) comically proposes a connection between capture on camera and death (a literal fotomaton), with actors slumping to the ground nearly as soon as the lens is trained upon them. Godard presents close-ups of the pistol and scissors—tools for shooting and cutting, actions proper to cinema production, but also for killing—in close sequence. He weaves a metaphoric entanglement similar to Oldenburg's, connecting death and the cinema. The final action scenes of Pierrot le fou involve the choreographies of numerous motor vehicles. Driving separate cars, Ferdinand and Marianne gracefully arc and weave around each other and trees before pulling up side by side and exchanging a kiss from their respective driver's seats. This auto-dance directly parallels Oldenburg's Autobodies, a 1963 happening with cars staged in a Los Angeles parking lot. Following Frederic Jameson and Ernst Bloch, the V-effect, Verfremdung, translates best to estrangement rather than defamiliarization. See Frederic Jameson, Brecht and Method (New York, 1998), 85–86 n13, and Ernst Bloch, "Entfremdung, Verfremdung: Alienation, Estrangement," TDR 15:1 (Autumn 1970), 120–125. According to Bloch's definition of estrangement, "The strange externality purposes to let the beholder contemplate experience separated, as in a frame, or heightened, as on a pedestal. As has been suggested, this leads increasingly away from the usual and makes the beholder pause and take notice. Thus a faint aura of estrangement already inheres in the kind of spoken inflection that will suddenly make the hearer listen anew" (123). Additionally, following William Burling, Verfremdung is best grasped as a subset of Umfunktionierung (functional transformation/refunctioning). See Burling, "Brecht's 'U-effect': Theorizing the Horizons of Revolutionary Theatre," in Brecht, Broadway, and United States Theatre, ed. Chris Westgate (Cambridge, 2007), 166–187. The U-effect, Umfunktionierung, includes practices that attempt "to convert institutions from places of [mere culinary] entertainment into organs of mass communication"; see Brecht, The Messingkauf Dialogues,trans. John Willet (London, 1965), 41, in "Brecht's 'U-effect. ': Theorizing the Horizons of Revolutionary Theatre." Godard includes various elements that perform similar didactic or revelatory functions in film. He makes spectators aware they are watching a film and further prompts them to reflect on the conditions of production. Often this is achieved via testing the bounds between reality and representation—and letting the former flow into the latter. For instance, at the conclusion of the first Total scene, the characters make statements that apparently refer to the story they are in: "It was an adventure film," Ferdinand says; Marianne counters, "It was a love story." Like Brecht, who had posters appear onstage at certain times, Godard employs texts equally to augment and disrupt the action. Moreover, Pierrot le fou bends and blends established elements of distinct genres and combines them in a new, "improper" fashion. The actor Belmondo gives an almost parodic performance of the Hollywood leading man. 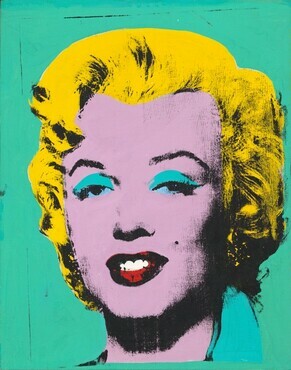 His iteration of heartthrob, it could be said, parallels Warhol's Double Elvis and Green Marilyn (1962) (fig. 17)—visual multiplications of stars that can be read to register the process of celebrity reification that buoys the film industry. Godard, "Let’s Talk about Pierrot," in Godard on Godard, ed. and trans. Tom Milne (New York and London, 1986), 217. See Bertolt Brecht, "Writing the Truth: Five Difficulties" (1934), in Galileo, ed. Eric Bently (New York, 1966), 131–150. He upsets the notion that he is producing a work of pure fiction by including an actual newsreel and radio report of fatalities in the war, which the characters listen to while driving. With a Brechtian spirit, Marianne says of the loss of life, "They say '115 guerillas' and it doesn't mean a thing to us." Indeed, the mass media—which brought the death statistics into countless living rooms—surely had an influence on artists and filmmakers alike. Godard's use of information parallels Warhol's paintings with headlines. Many of Warhol's works in this mode mention death statistics, such as his painting 129 Die in Jet (Plane Crash) (1962). He was interested in exploring the way that a morbid curiosity with death drove people to buy newspapers. Moreover, following from Marianne’s analysis, encountering and contemplating abstractions of death out of context—in a gallery space or movie theater—prompts further reflection on the way it can be reified. Godard shows the ways that mediation abstracts tragedy and death, converting them into goods to be consumed by hardened news addicts. Fig. 18 - Still from Jean-Luc Godard, Pierrot le fou, 1965, color, courtesy of Rialto Pictures. Warhol too registered both the mediatic appeal of Mao in his numerous renditions of the premier's portrait from the early 1970s; Lichtenstein also treated the subject of Mao in 1971. True to his namesake from the Commedia dell'arte, Pierrot/Ferdinand is spurned by the female protagonist. Betrayed, Ferdinand strikes back and kills Fred and Marianne. Distraught by what he has done to his lover, he decides to kill himself. Warhol once mentioned that he wished he had been able to film his friend Freddie Herko's suicide: as part of the Death and Disaster series Warhol created Suicide (1963). Like Warhol's, Godard's representation of this tragedy is highly aesthetic: Ferdinand paints his face sky blue following Marianne's death. The film cuts to an azure notepad with a handwritten “1a rt” on it; for a moment it seems as though Ferdinand might be on a path back to the art (l'art) that began the film, but it is toward death (la mort) that he is driven: the missing "mo" is penciled in. He wraps a layer of yellow nitramite around his head then encircles it with bright red dynamite. The blue, yellow, and red palette recalls Lichtenstein's. Ferdinand lights an entire box of matches and sets off the fuse. He regrets it almost immediately and tries in vain to extinguish it. "Merde," he says, instants before he is consumed in an explosion so sudden that the timing feels almost comical and certainly evokes some of the absurdity of death. Following the termination of Pierrot/Ferdinand, Godard concludes Pierrot le fou with a traveling shot of a blue sky and horizon: not quite transcendence or eternity, but rather, as Ferdinand and Marianne's voiceover tells us, "Just the sea. And the sun." Godard in “Pierrot My Friend,” in Godard on Godard, ed. Jean Narboni and Tom Milne (New York, 1986), 215; Godard in “Let’s talk about Pierrot,” in Jean-Luc Godard par Jean-Luc Godard, ed. Alain Berglia, trans. David Willis (Paris, 1985), 263. Donald Judd, “Specific Objects” (1965), in Theories and Documents of Contemporary Art, ed. Kristine Stiles and Peter Selz (Los Angeles, 2012), 138. Jean-Luc Godard cited in Jonathan Cott, "Jean-Luc Godard: The Rolling Stone Interview," Rolling Stone, June 14, 1969, http://www.rollingstone.com/movies/features/jean-luc-godard-19690614 (accessed on May 11, 2017). Andy Warhol quoted in Warhol and Pat Hackett, POPism: The Warhol ’60s, (New York, 1980), 280. Godard in Andrew Sarris, Interviews with Film Directors (New York, 1969), 172–73. Mohammed Sassi, "Compagnie Française des Pétroles and Its Contribution to the Re-establishment of France’s Position among the Oil Countries after the Second World War," Business and Economic History 4 (2006): 1–15. Like Warhol Godard explored the motif of the auto wreck repeatedly. He staged his own "Saturday disaster" in his famous seven-minute traffic jam and bloody collision travelling shot in Week-end (1967), a film that can be considered a "double" of Pierrot le fou. Oldenburg quoted in "Lot 353: Claes Oldenburg & Coosje Van Bruggen SCREW ARCH MODEL," Sotheby's, September 25, 2013, www.sothebys.com/en/auctions/ecatalogue/lot.353.html/2013/contemporary-art-n09010, (accessed June 10, 2017). See Warhol quoted in Swenson 1963, reproduced in "Statements," 392. Following Frederic Jameson and Ernst Bloch, the V-effect, Verfremdung, translates best to estrangement rather than defamiliarization. See Frederic Jameson, Brecht and Method (New York, 1998), 85–86 n13, and Ernst Bloch, "Entfremdung, Verfremdung: Alienation, Estrangement," TDR 15:1 (Autumn 1970), 120–125. According to Bloch's definition of estrangement, "The strange externality purposes to let the beholder contemplate experience separated, as in a frame, or heightened, as on a pedestal. As has been suggested, this leads increasingly away from the usual and makes the beholder pause and take notice. Thus a faint aura of estrangement already inheres in the kind of spoken inflection that will suddenly make the hearer listen anew" (123). Additionally, following William Burling, Verfremdung is best grasped as a subset of Umfunktionierung (functional transformation/refunctioning). See Burling, "Brecht's 'U-effect': Theorizing the Horizons of Revolutionary Theatre," in Brecht, Broadway, and United States Theatre, ed. Chris Westgate (Cambridge, 2007), 166–187. The U-effect, Umfunktionierung, includes practices that attempt "to convert institutions from places of [mere culinary] entertainment into organs of mass communication"; see Brecht, The Messingkauf Dialogues,trans. John Willet (London, 1965), 41, in "Brecht's 'U-effect. ': Theorizing the Horizons of Revolutionary Theatre." See Bertolt Brecht, "Writing the Truth: Five Difficulties" (1934), in Galileo, ed. Eric Bently (New York, 1966), 131–150. Jean-Luc Godard, "Parlons de Pierrot," Cahiers du cinéma 171 (October 1965): 25.